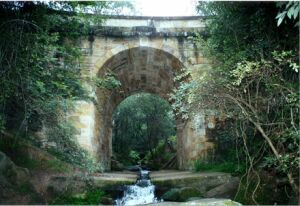 Lennox Bridge - Lapstone Hill - Blue Mountains Australia - History. Oldest bridge on the Australian mainland, also known as The Horseshoe Bridge. 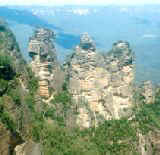 Mitchell's Pass was the third road to be built up the eastern escarpment of the Blue Mountains. Major Thomas Mitchell surveyed & recommended the construction of a road along this route, in preference to the governor's suggestion of stationing a permanent repair gang on the existing Lapstone Zig Zag Road (now Old Bathurst Road). Mitchell believed in building things to last, & was determined to have a stone bridge, rather than the flimsy timber variety so far constructed in the colony. To Mitchell, well designed bridges were one sign of a civilised society. They were ".....the most indispensable of public works. Such works constitute the capital of a nation - no country is thought anything of that does not possess them". Unfortunately, no suitably skilled & experienced people were thought to be in Australia at the time. In a classic piece of good timing, one David Lennox arrived in Sydney, having decided to emigrate after the death of his wife. A master stone mason of twenty years experience, including several bridge projects in England, Lennox was discovered by Mitchell building a wall outside the Legislative Council Chambers in Sydney. Both men knew an opportunity when they saw it, & Lennox ".....left his stone wall & with his shirt sleeves still tucked up - trowel in hand - undertook to plan stone bridges for this colony". Lennox's job required him to "furnish the designs, construct the centering, & direct the application of convict labour to stone cutting & setting, & to all the branches of carpentry & masonry necessary for the construction of a bridge". He was assigned a team of convict workmen, with whom he is said to have established a good relationship. In July 1833, Governor Bourke rode up the new pass to the Pilgrim Inn. The bridge continued to be part of the main route to the west until 1926, when the highway was re-routed across Knapsack Viaduct. 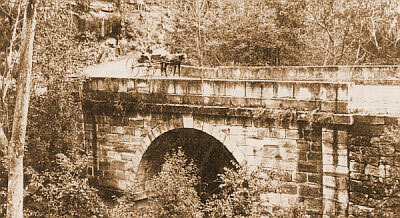 Lennox's Bridge in the 1880's. Lennox & Mitchell could never have anticipated the forces exerted on the bridge by heavy trucks, taking a short-cut down the mountain, slewing around the curve of the bridge. Eventually, structural damage necessitated closure of the bridge in the 1950's. After being dismantled & rebuilt, historic Lennox Bridge was re-opened to light traffic in 1982. The road below the bridge is now one-way traffic down to the old highway at Emu Plains. Access Mitchell's Pass by leaving the highway at McDonalds, Blaxland, & proceeding straight ahead. Walking tracks link Lennox Bridge to Elizabeth & Marges' Lookouts, and Knapsack Viaduct. Cyclists can ride from Blaxland railway station, down Mitchell's Pass, & detour to Knapsack Viaduct before proceeding to Emu Plains railway station. Recent photo of Lennox Bridge, from the northern side. except where other copyright applies.